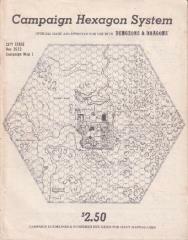 A booklet of 55 light gray hex fields ideal for use in mapping with colored fel-tipped markers. Hexes are numbered and .3" in size, making them .2 mile for the standard D&D 5-mile wilderness hex. In addition, the 64p booklet has six pages of tables for generating forests, wilderness encounters, flora and fauna, terrain features, and the other myraid details of a wilderness campaign. This is one of our best-selling products and has generated many sub-systems, detailed elsewhere in this catalogue. The hex grids may be put to many other uses, but the Campaign Hexagon System has been specifically created and approved for use with D&D.